The words “Australia” and “beaches” have almost become synonymous. When you think of Australia, you instantly think of white sandy beaches and gorgeous coastal towns. Australian’s love the beach and more importantly, they love to surf, so it’s no surprise that this one Australian surfer wanted his house right by the beach. 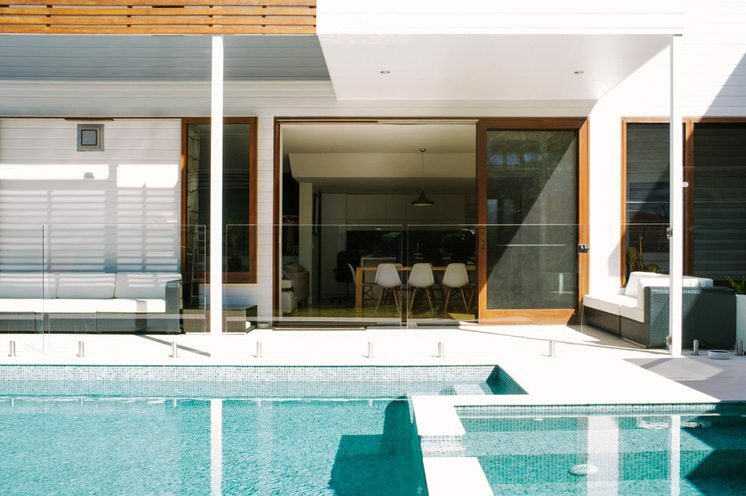 Situated in Byron Bay on the East Coast of Australia (just above Sydney), this stunning five bedroom house is perfect – inside and out. The owner is a surfer who works from home, who wanted the house to have sort of obvious association with the surrounding flora – and it has achieved just that. The houses central feature is the outside courtyard, which the architect, Davis Architects, based the house around. A lot of work went into this house, making it not only aesthetically pleasing to look at, but also functional. 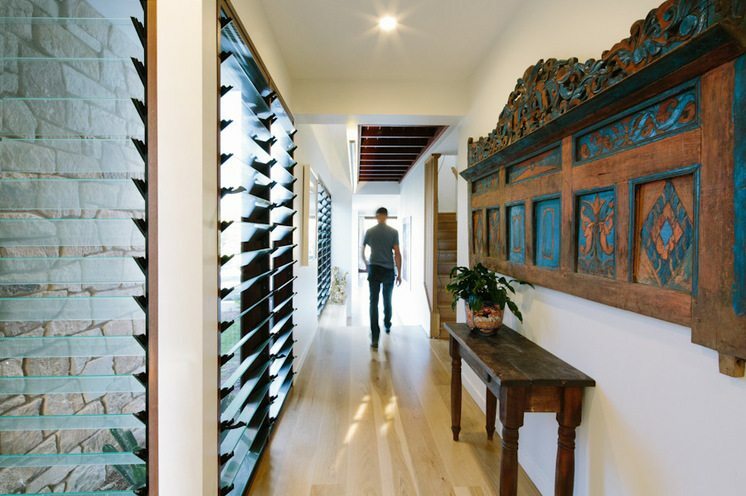 Davis Architects stated that the client wanted the house to be multi-purpose, allowing for a growing family, a home run business as well as having rooms for entertaining guests and friends. Every turn, wall, window and balcony was carefully placed when designing the house. The northeast fresh breeze that is so prominent in the upper parts of New South Wales, inspired the architects to incorporate a breezeway hallway with ceiling to floor windows as well as a breezeway in the stairwell to really capitalise on that cool wind that blows through. Daivs also talks about how the front of the house, utilizes a natural wood and weatherboard design to blend in beautifully with the surrounding houses. Nothing worse than having one house on the block stick out like a sore thumb. 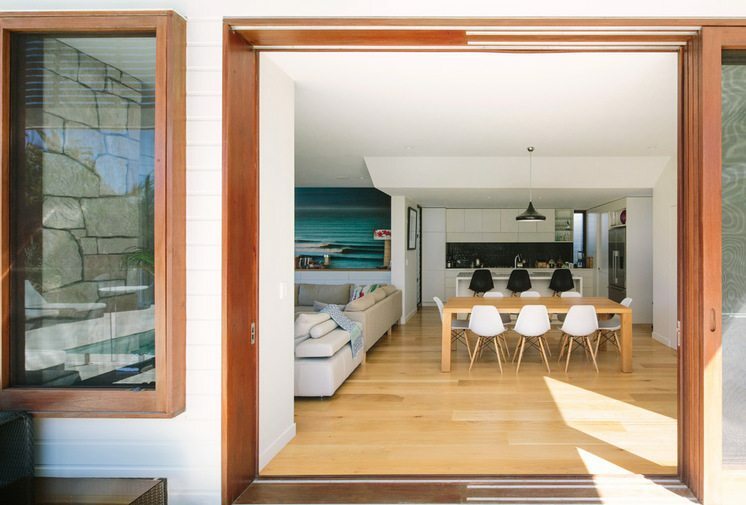 The house also uses natural wood where ever it can to help it blend into the natural environment of sunny Byron Bay. Davis even goes on to state that all the natural wood was sourced locally, something I am sure the residents of Byron Bay were pretty happy about. 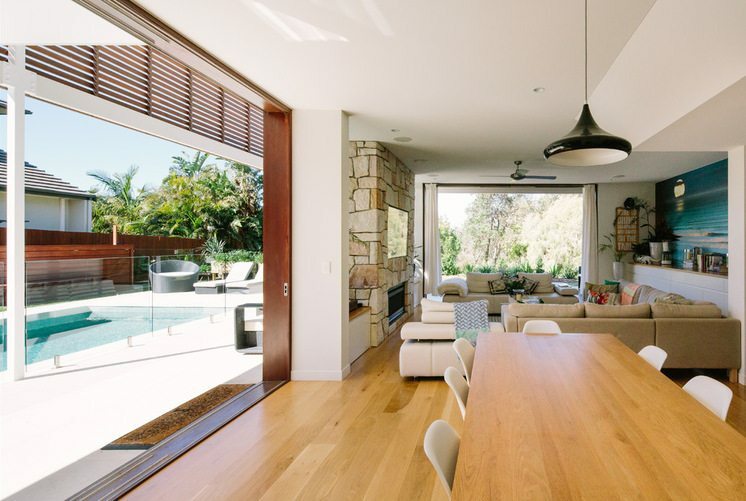 Throughout the house you are going to find some blackbutt timber, which is light in color and somewhat irregular with it’s patterns and shape, which Davis says, “helps to create a relaxed coastal feel”.